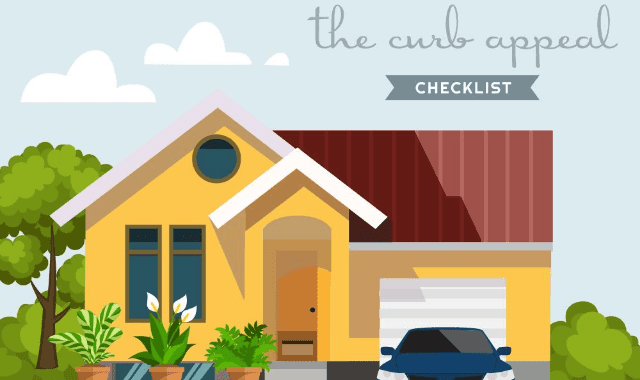 The Curb Appeal Checklist #Infographic ~ Visualistan '+g+"
As you prepare your property for sale, it's important to make a great first impression to your potential buyers by beautifying your home from inside out. If you have a front yard, doing something as simple as mowing the lawn and adding some flower pots will make a huge difference. Another simple but impactful change would be to replace the front door with something eye-catching or unique. There is a phrase called curb appeal that refers to the attractiveness of a property for sale when viewed from the street, and you definitely want to take any opportunity you can to boost your home's curb appeal. Once you are able to impress the potential buyers with the outer appearance of your house, you have to make sure the inside of the house will keep them interested. That means you need to do a thorough cleaning of the entire house and replace a few older items that may detract from the overall charm of your home. A fresh coat of paint in the kitchen, a new toilet in the bathroom, some new lighting fixtures in the living room, there are many inexpensive but important changes you can make to boost your home's value in the buyers' eyes. To give you a little inspiration, check out ETO Doors' infographic for 17 simple ways to beautify your home on a budget.